The first rule of writing is to never tell your audience, outright, that you are telling them a story. But what if I do? What if I told you that I AM telling you a story—telling you the story of how things currently exist, the narrative upon which so many of our institutions were tenuously built. And, then, what if I told you it’s time for a NEW story? A new story with new characters—all of the voices brought to the table. 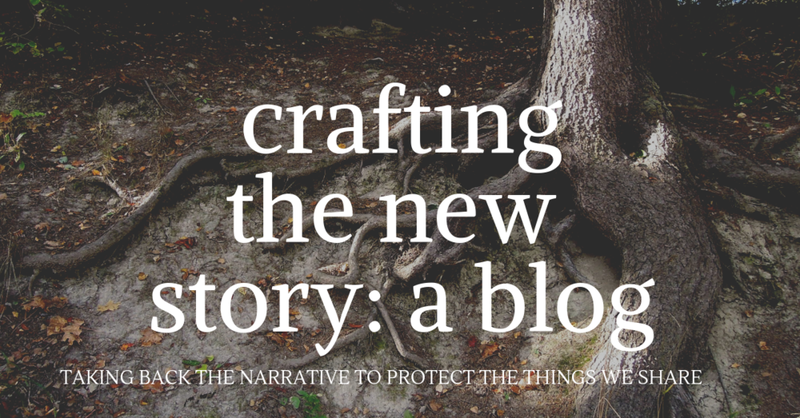 A new story with a new theme—one of the public trust and the government’s responsibility to protect the things we share. A story with a new ending—one that doesn’t include the complete and utter degradation of the earth. An ending in which corporate wealth doesn’t take precedence over public health. An ending where future generations have inherited a liveable Earth because of the work we did together. Well, I think that might just be a story worth telling. I’m Kayhla, the newest member of SEHN’s staff and I want to share part of my story, how it links to the things we all share, and the new story we all need to create. In the 6th grade I was diagnosed with Osgood-Schlatter disease, finally giving diagnosis to my constant painful, swollen, bruised knees. In Osgood-Schlatter disease, a fairly common condition for athletic children, the rapid growth of muscles and bones with the added stress of running and jumping causes a great amount of sensitivity and irritation of the tibial tuberosity-- which is the real name for that bump you have on your knee, but never knew what is was called-- the one underneath your kneecap where your patellar tendon and shin meet. Yeah, that one. When I was in my last season of varsity field hockey in high school, the pain in my right knee was terrible-- worse than I had ever felt before. It turns out that for 4 months, I was pushing myself to run about 20 miles a week with an avulsion fracture of that tibial tuberosity, that weird little bump. In hindsight, it didn’t really come as a shock to anyone that, after 6 years of being pulled, strained, and forced to exert more force than it could handle, my knee had finally snapped. I think about that a lot-- the grinding away at my own bones until one inevitably fractured. I think about it a lot because I feel it often, systemically. If you take a moment to think about it, it’s obvious that we are all contributing to this same kind of strain on the earth and on our own bodies. We are relentlessly degrading the earth, stripping it of precious materials, filling it with plastic and toxic chemicals, and treating it as though it will endlessly provide for us. But it won’t last forever-- the earth simply cannot endure the relentless grinding of the Anthropocene. We can see the earth showing us, systemically, that it is treacherously close to its own avulsion fracture-- through the rise of climate-related health impacts like asthma and other respiratory illnesses, emerging and re-emerging infectious diseases, and the continuous poisoning of all living things. We now have evidence of traces of plastic found in the greatest depths in the ocean and in our drinking water, traces of pharmaceuticals in fish, and the levels of toxins in our own bloodstreams increasing with time. The earth - and many of our bodies - are both close to its breaking point. It’s clear this particular story is not being written to end well. But what if we take back the narrative? Change the ending of the story before it’s too late? If you are reading this, you already know about SEHN and value it. You already know the incredible work of Carolyn, Ted, Ann, and Sherri. What you don’t know is why, as a young environmental scientist, I value it so much. SEHN is a lifeline for someone like me, attempting to bring new knowledge and valuable experience into the field. It’s despairingly difficult to find truly meaningful work as a young professional in this political, social, and economic climate. There isn't a shortage of young people looking to dedicate their lives to meaningful work-- there is a shortage of organizations who are doing the work in a way that matters. SEHN doesn't offer quick-fix, band-aid solutions to problems, it spans down through the tree of life to the roots of the problem and is working to create a new story about our future. Yes, the obvious is true-- I value SEHN because the work matters, the precautionary principle is necessary to prevent the preventable suffering, and the ecological model of health is the model to which we should aspire as it looks to not only understand and treat disease, but it looks to prevent it in the first place. I value this organization because it is more than just an opportunity for me to grow and learn from amazing people. I value it because they are an organization committed to working with others to shape the new story. To creating those new institutions we need for the work ahead. When I think about SEHN, I don’t just think about the impact of our work on public trust or the Women’s Congress for Future Generations, new agricultural methods, or ecological medicine. I see the people who do this work. I see Ann’s emoji text messages of thanks, active emails in the middle of the night, her passion for people, and the overflowing abundance of her compassion which pairs so well with her ingenuity in creating opportunities for communities of people to gather and share their vision and passion for creating a new future. I see Ted’s emails of interesting articles we should all find time to read and his burgeoning interest in beauty as an essential element of ecologic health. I can hear his voice on our staff calls telling us about his daily work to re-integrate medicine, public and environmental health --- providing his signature unbridled thoughtfulness to every discussion. I hear Sherri’s laugh, see her endless support, and willingness to problem-solve. Her keen eye for detail and penchant for humor. I see Carolyn speaking truth into being at conferences with her sharp mind and, yet, soft mindfulness. I see her dedication to future generations through 20+ years of bringing law, science & ethics into a new story of well-being that protects all that we love and share. I revel in her love of poetry and winter. I even see myself-- in awe of these people who have dedicated their lives to a more difficult path—people who manage to find a hopefulness within each day that what we do matters. I see people humbled and strengthened by experience who have the kindest hearts and the ruthless persistence it takes to actually make a difference. They have experienced harm and setbacks in their careers, but, like previously broken bones, have remodeled themselves, growing stronger into the backbone we all need. I am grateful for this opportunity to learn professionally and collaborate to create actual change, but I am most grateful for the opportunity to add my voice to this community of people dedicated to crafting a way forward. Most importantly, I see the people who make SEHN’s future possible. I see all of you working each day in your own ways to affect change locally and globally. I see people just like me who are waking up each day to stare down the interminable 24-hour news cycle who are relentless and persistent in their advocacy for the rights of people and the rights of the earth. You are the reason this work is not only possible, but worth it. Each triumph, each victory is made possible by you. Because of you, we are still here. And because of you, we will continue to do the work that needs doing. Will you renew your support today? Without you and without SEHN, the earth and all its creatures will continue to suffer-- the ever-grinding, relentless chipping away at our precious, shared resources will continue to exert too much pressure on the earth-- until, much like a stressed bony bump on a knee, it fractures. Help us create the new story that protects what we love and what we share. Please give what you can today. P.S. This year a major focus of SEHN’s work is to leverage our decades of work on the powerful role governments can play in protecting our common wealth and public health. We are dedicated to working at the grassroots level to re-imagine and re-design government. Our Networkers and the new “Activist Tips,” Teach-Ins, peoples budgets, are all ways we will help shape a new story that allows us to have a very different ending.